This is a great companion for your massage table. Weighing less than 5 pounds and with its conveniently attached carrying strap, you will find it easy to take with you for any outside appointment. Because it folds flat, it takes up very little space, making storage and transport easy. 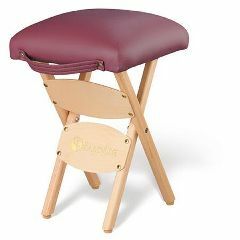 More than just a stool, you can also use it as an armrest for your client or fold it down and kneel on the pad to save your knees. Available in many colors of Doeskin.